For many, the journey to medicine is circuitous—pursuing what you love can lead to an unexpected experience that changes the direction of your life. Such was the fate of first-year Geisel School of Medicine student Heidi Robbins. Grounded in the humanities, Robbins pursued her love of art history and language in her first year of college where an early fascination with African art and culture and led her to begin studying Swahili—her goal was to spend the summer in Dar Salaam, Tanzania to further learn the language. Heidi Robbins ’21, in Dar Salaam, Tanzania during her first year at Princeton University. But summer in Dar Salaam shifted her course. 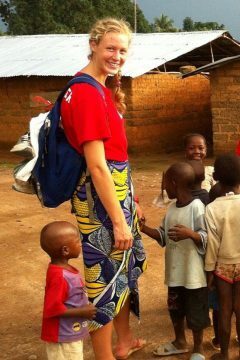 Robbins returned to Africa during her sophomore and junior summers—in Sierra Leone as a volunteer working with patients in the same community that would later be struck with the Ebola virus, and in Samburu County in northern Kenya to study a herpes virus causing significant numbers of hemorrhagic deaths among juvenile Asian elephants. One morning in Kenya, Robbins awoke to gunshots. A recent drought had left villagers with scarce resources and two local tribes were embroiled in a retaliation over stolen cattle—firing at people randomly, the Samburu were attacking a nearby Turkana village. When Robbins headed home three weeks later the 40 or so villagers remained living in the camp. Robbins viewed her collective experiences as pieces of a puzzle—breaking them apart to analyze how they fit together and where she fit in. By the time she graduated, she knew medical school was in her future. A walk-on rower in college, Robbins could have not imagined she would earn an NCAA title and Ivy titles with her teammates—and an invitation to train on the US National Team following graduation meant that a career in medicine would be postponed. She decided to find out. For the next four years training defined her life, and the effort paid off—boats she was a part of set a new World Best Time in 2013, defended World Championship titles in 2014 and 2015, and earned Olympic qualification. It was an exciting time, but she fell short of her goal. Sustained injuries prevented her from qualifying during the final selection for the 2016 Summer Olympics. “If you are an athlete training for the Olympics, you are committed to that dream. For me it began with a sport I loved and a team I loved, and eventually that Olympic dream did come into focus. But in the end, my back didn’t hold up,” she says. “Although your head is down and you’re just trying to get a little faster every day, you must look up and take stock of that goal. So, yes, the timing of the injuries was heartbreaking. Nearing the end of her first year of medical school, Robbins says she is grateful for her rowing journey and the lessons she learned because the led her to a greater appreciation for the importance of empathy in medicine. Susan Green is a writer in the Geisel Office of Communications and Marketing.